How long had it been raining when the floods started? Estimates varied with the level of hysteria. I recall constant drizzle, interrupted only by flashes of violent storm, for ten days prior. The fantasists, losing all sense of perspective, began to say the rain started the day the snow stopped. But however calmly one faced the torrent, its eventual effect was still dizzying. The rain fell with such persistence, such determined obliviousness, that a feeling of celestial bullying was inevitable. 'How can there be more?' we asked on soggy Wednesday evenings, watching walls of rainfall slosh heavily to the ground. The earth was sodden, a clogged pulp choking under the onslaught. I alternated shoes - soggy or soaked? Neither pair had time to dry. I clambered over banks of saturated grassland; slipped swiftly along roads that danced frenetically in the downpour. So wet was the air I thought it made me short of breath! Dodging the fat, falling bullets became a kind of manic sport. The effect was somehow cumulative: every time I went outside, it wasn't simply that I got wet again; it was that I got wetter than ever before. Evidence (if any were needed) of my melodrama: most Czechs shrugged it off. I darted into lessons, convinced it might be our last, the tumbling sounds of rain still audible on the roof. They said it had happened before, and worse. By mid-week the sirens were becoming increasingly regular. 'If it's the end of the world,' Siobhan said, 'it's very quiet.' It was like the Day After Tomorrow except nobody had noticed. 'This is the way the world ends,' I said, 'not with a bang but with the occasional siren.' Everybody just carried on: with work; with walking the dog; with washing the car. One student, let's call her Barbora, told me of the night she'd been evacuated. The government had already issued a state of emergency when she walked down to survey the river. It hadn't yet crept over the rim of the bank, so she decided to leave it another night. Returning to her swanky apartment block (built in the 80s for the big dogs at the Ministry of Information), she washed the dishes in a growing puddle. It was two in the morning when they started banging at the door. Answering, half-asleep, she was told that everybody else had left the building. She grabbed her son, wrapped in a neon-yellow leather jacket, and carried him downstairs. Sirens blazed and squadrons of fire-fighters hurried past in the gloom. 'Wasn't your son scared?' I asked. He was half-awake when he saw the fire engines, blazing lights flashing on the rising water, and excitedly pointed them out to his mother. (Ah, the bravery of the half-asleep! As Siobhan tells me, nothing can get you when you're dozing!) They drove to her parents', elevated high above the tumult somewhere in Prague 4. She didn't take a single day off work, but was instead working shifts with the neighbours to monitor the empty building for break-ins. Such is the civil vigilantism that possesses Prague's middle class in times of crisis! Presumably they didn't want a repeat of last time, when -legend has it - gangs of Roma (always gangs!) went on looting sprees around submerged neighbourhoods. Apparently one group, caught carrying a flat screen TV by the police, claimed simply to be rescuing it from the water. They had found it idling downstream and were looking for the owner. Siobhan took some photos of the city with the river at its height. What was Prague had become a giant waterway with just a topping of castle at its peak. Whole islands were consumed, just the tops of trees visible like the misplaced heads of broccoli in a very brown soup. Central Europe's biggest nightclub was up to its knees. Even the gulls had fled. Charles Bridge was taped off, a gaggle of police officers leaning heavily on its walls. Its fleet of stone bishops seemed to wrench their fists upwards in a desperate bid to escape the swelling surface. These contorted icons of the counter-reformation were ever-ready to lift off, to escape these heathen lands, but never more so than when the inflated top of the Vltava tickled their toes. While for us ex-pats the floods were an unprecedented menace (imagine London flooding! ), for Czechs this was nothing new. 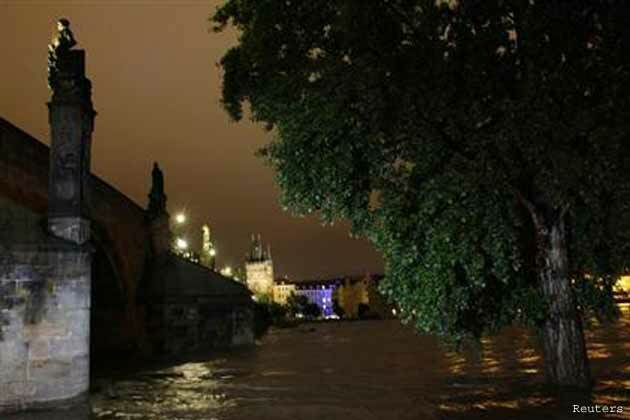 According to one website, which with typical black humour lists "floods" under the "attractions" section, the Vltava floods "more or less twice a year". 1432 saw the greatest flood, when "people paddled boats around the Old Town Square". In 1843 the "river was a kilometre wide at the Charles Bridge", presumably swamping Malá Strana. In 1890 "heavy rains persisted for the whole year, and for four days, from the 1st to the 4th September it rained continuously." So, celestial bullying is nothing new! Twenty soldiers were reportedly killed trying to dismantle a bridge at Invalidovna. Their intention, however misguided, was to save the bridge. As the floods began news.cz started keeping an invaluable blog. Every school in Prague declared itself closed. That is, until half an hour later, when Pragues 9 and 15 changed their minds. Somehow Prague 6 (somewhere up the hill, defended by the almighty Castle) declared itself swamped. Though the zoo was flooded, we were told not to worry, as the gorillas were safely enclosed in their "flood tower". Some students reported the following day that the only casualties so far had been two rafters, but, given the speed and danger of the water, they were probably mad and it was no one's fault but their own. I saw it as an act of drunken bravery, a final act of infamy by a pair of local miscreants. Sadly for them, however, their deaths were met with a shrug: "Well, it's your fault for being there." Then came the news of randomly falling trees. One woman was squashed whilst walking her dog, apparently nowhere near the water. So sodden had the ground become that trees were simply freeing themselves from their earth-bound tethers. There has always been something damp about Prague. Its Jewish Ghetto, Josefov, was perpetually overrun with ground-water. Ripellino describes the old cemetery: "Dense clusters of crooked, broken gravestones protrude, leaning like Bueghel's blind men, sinking, soon to be swallowed by the damp black earth. "1 Rabbi Loew, the mythical creator of the Prague Golem, was said to have had his grave shifted in order for his grandson to lie next to him. He wasn't, however, dug up, but simply slid through the dank emulsion. Indeed, the Prague Golem, the raging embodiment of mystical vengeance, was itself formed of the Vltava's silt. The Golem contains an element of the Vltava's dark, treacherous energy: animated clay formed by dubious alchemical spells. It is this same energy that periodically lashed out (in the form of pogroms) at the Jewish quarter. According to Liliencron the Golem "uproots trees/tosses houses into the clouds/hurls people in the air." Prague's Jews were, for centuries, locked up in the Ghetto. When they left, for reasons other than those matters of business which were strictly sanctioned, they risked being attacked. Even when they stayed home, they risked much the same. Josefov was eventually torn down, its slum-like lanes replaced by grand Parisian boulevards. Despite the fact that, today, it has become Prague's most expensive quarter, it remains indelibly linked to its Jewish past. The Golem, its very creation a matter of the necromancy blamed for centuries on Jews, is an expression of the forces arrayed against Ghettoised Jewish life. The perpetual sogginess was just one. Everyone's a poet in front of expressions of the sublime. As the river swelled, I imagine pens scribbled. Only the police remained sulkily unimpressed, if only because they had to stand in the rain and watch it longer than anyone else. Inch by incremental inch it grew. It's nonetheless fitting that the only poem I've tried (unsuccessfully) to write about Prague is about its sogginess. In it Petřín Hill (so noisily verdant in spring) is a gnarled black boot; the trams are feral creatures hunkered down at its foot. Everything is grey from months of saturation, the colours drained steadily out. A water sprite (Vodník) splashes around in the shallows of the canals around Kampa. Its central problem, as a work of poetry, was that it existed only to formulate a grumble, and so beyond my complaints, the poem - unlike the water- was going nowhere. 2002 saw the greatest floods of recent times. By the 14th August the river had reached a flow rate of roughly 6000 m3/s. Its typical rate for the time of year was just 50 m3/s. 50 000 people were evacuated. Karlín, already one of the city's poorest quarters, was utterly ruined. At that time an eighth of the city's surface was underwater. It took a decade to repair the damage. Compared to that destructive force, this year's downpour was a mere blip. Indeed, the city's new flood defences appear to have held up pretty well. Just as the rain began to slow, the river's force began to abate. On the day the rain stopped a snowfall of white blossom swept the city, every inch the archetypal rom-com love metaphor. Despite the undertow of cliché, the effect was breathtaking. Dryness itself (previously taken for granted) was felt with the force of liberation! Amid the new warmth, however, the forecasts continued, day after sunny day, to predict new rain. It was as if the weather forecasters had simply relinquished scientific analysis and were going on bleak odds alone. Always assume the worst, they seemed to be telling us. Fatalism, at least in the Czech lands, seems to pay sombre dividends.